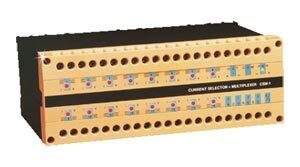 The DRA-CSM-1 Current Multiplexer is a solid state multiplexer capable of transferring the selected 4-20 mA input current signal to the output terminals in less than 10 microseconds at an accuracy better than 0.01%. The DRA-CSM-1 is typically controlled by a PLC thereby obtaining full data synchronization. The DRA-CSM-1 is provided with a unit enable/disable control line which enables the parallel connection of several multiplexers to the same controller input. The period during which the unit is disabled is used for self-testing according to a self-test procedure which checks the unit’s hardware. Model DRA-CSM-1 is powered by an external DC power supply. Each two-wire 4-20 mA transmitter is connected to the input terminals. Each channel provides a current limited voltage supply for the connected two-wire transmitter. The channel selected by the multiplexer is directed to the control device’s (e.g., PLC’s) analog inputs. Power is maintained by the multiplexer to the unselected channels thereby maintaining uninterrupted transmitter current flow. Each 4-20 mA input channel on the multiplexer has its own red LED status light which illuminates on presence of current in the loop.